This is a truly unique piece. 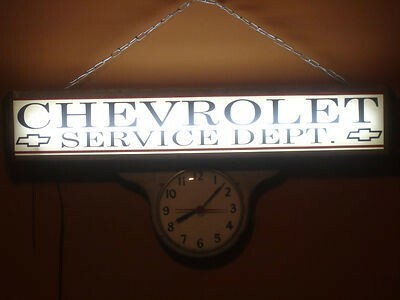 This hanging Chevrolet Porcelain Sign has a clock attached to the bottom. Attached to the top of the sign is the cable that is used to hang it. The sign reads “Chevrolet Service Dept. and is back lit, therefore making this a neon sign. The sign was likely hung in the Service Department’s waiting room.